WASHINGTON (CNN) -- One week after Sen. Hillary Clinton made a public show of unity with Sen. Barack Obama, a new survey suggests supporters of the New York senator are increasingly less likely to follow her lead. Sens. 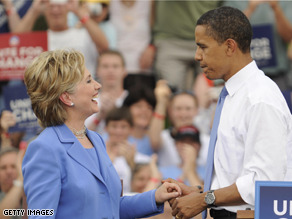 Hillary Clinton and Barack Obama appear at a unity rally in Unity, New Hampshire, in June. A growing number of Clinton supporters polled say they may stay home in November instead of casting their ballot for Obama, an indication the party has yet to coalesce around the Illinois senator four weeks after the most prolonged and at times divisive primary race in modern American history came to a close. According to a CNN/Opinion Research Corp. poll released Friday, the number of Clinton supporters who plan to defect to Republican Sen. John McCain's camp is down from one month ago, but -- in what could be an ominous sign for Obama as he seeks to unify the party -- the number of them who say they plan to vote for Obama is also down, and a growing number say they may not vote at all. In a CNN/Opinion Research Corp. survey completed in early June before the New York senator ended her White House bid, 60 percent of Clinton backers polled said they planned on voting for Obama. In the latest poll, that number has dropped to 54 percent. In early June, 22 percent of Clinton supporters polled said they would not vote at all if Obama were the party's nominee, now close to a third say they will stay home. That number is significantly higher than it was in early June, when 35 percent of Democrats polled said they preferred Clinton to lead the party's presidential ticket. Obama won 59 percent of support from registered Democrats polled in June; now he garners 54 percent. "These things always take time to heal," said Bill Schneider, CNN senior political analyst. "I think Clinton's supporters are waiting to see if Sen. Obama will pick her as vice president. That would certainly be very healing to them." But the question remains whether Obama can win enough Democrats without Clinton as his No. 2. "If he doesn't pick her, a later stage of grief is depression and then acceptance," Schneider said. "In the end I expect Clinton supporters will accept Obama, because they will listen to Sen. Clinton, who has said the stakes are too high for Democrats to sulk." The analysts said maybe more than four weeks is needed for many of Clinton's most devoted supporters to move past her loss, especially considering the primary campaign stretched more than 17 months. "Many voters find it tough to immediately switch allegiances to a candidate that they once opposed, so they find a 'neutral' setting more comfortable for awhile," said Keating Holland, CNN polling director. "If that's what is happening to the Clinton supporters who now say they plan to stay at home, Obama may have nothing to worry about. If not, there's a big chunk of the party base that Obama won't be able to count on in November." While Clinton's stock among many Democrats remains high in the latest poll, her husband's is decidedly lower since a year ago. Much has been made of Bill Clinton's role in his wife's White House bid -- the increasingly aggressive campaign style, the sharpened attacks leveled at Obama that some viewed as carrying racial overtones and the outbursts at some reporters over what he viewed as unfair media coverage. The former president increasingly came under fire from neutral Democrats and party elders concerned he was fracturing the party in an election cycle during which Democrats appeared to hold the advantage in nearly every way. Among all registered voters questioned in the latest poll, his approval rating is down 9 points in just more than a year, from 60 percent to 51 percent. "Former presidents are supposed to be above politics, but Bill Clinton couldn't be above it in this campaign since his wife was a candidate for president," Schneider said. "But he was seen as too political. Democrats thought it was appropriate for him to support his wife but not appropriate to get overly critical of Obama." So can Clinton, who left office eight years ago with approval ratings well over 60 percent, repair his image with most Americans? "He needs to show he's gotten over it," Schneider said.